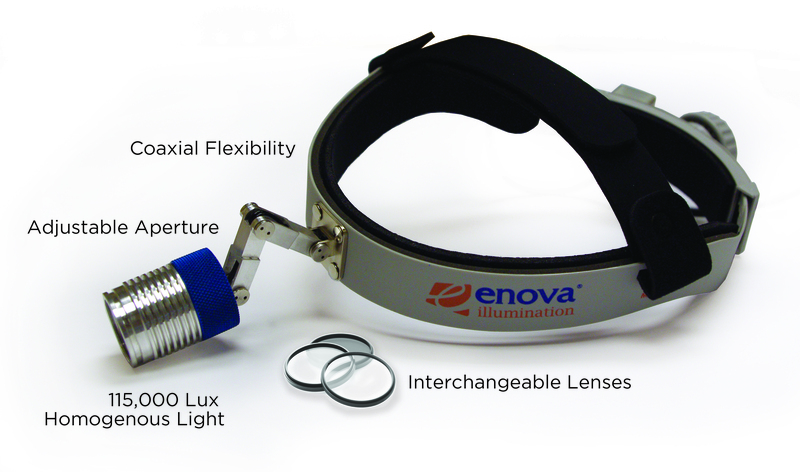 Since 2005, Enova has specialized in making LED surgical headlights designed by surgeons for surgical use. We have manufactured LED surgical headlights longer than any other brand and we focus on the manufacture of LED headlights only. They are our passion. The hallmarks of Enova LED surgical headlights are exceptional illumination, extra long battery life, reliability and comfort. Enova LED headlights illuminate the entire surgical field with white light providing excellent tissue rendition. They are ideal for surgeons wanting portable headlights that are not tethered to a fiber optic system. All power is provided by digital battery packs with life up to 24 hours on a single charge. Surgeons love the comfort of a perfectly balanced, lightweight headlight. At Enova, customer service is a priority. If you have a problem, we will address it within a day. You get personalized service every time, all the time. We have manufactured LED surgical headlights longer than any other brand and we focus on the manufacture of LED headlights only. They are our passion. A primary advantage of LED headlights over fiber optic lights is that LED headlights provide complete mobility in the OR with no tether to a fiber optic light source. There is significant cost savings as well. The primary advantage of Enova LED headlights over other LED brands is brightness, extra long battery life, robust construction and comfort. All models of Enova headlights have excellent brightness ranging from 100,000 lux to 200,000 lux. The illumination is pure white, 6100 degrees Kelvin—like sunlight on a cloudy day. They have fully adjustable intensity from 100 percent down to 30 percent. And, they have extra long battery life ranging from 4 hours all the way up to 24 hours, depending on the model; a battery life indicator on the battery is available as well. The robust construction of Enova headlights allows them to withstand the rigors of everyday use. The headlamp is aluminum and there is double padding inside the headband. They are ergonomically designed to be lightweight and perfectly balanced. For instance, the XLT-125 weighs only 7 ounces and D-200 weighs 9 ounces. Enova’s three most popular headlights are the XLT-125, D-200 and S-100. Each model has its own video or will soon. Please visit our YouTube channel to see all of our videos. Have You Tried Enova XLT-125 LED Surgical Headlight?